Do you want to have a hassle-free day out with your baby? Mothers know how inconvenient it is to travel with a baby. You need to bring all essentials like diapers, milk bottles, changing pad, toys and more to keep baby comfortable and full while traveling. Even a short trip to the doctor or a quick errand can be a major operation. If you find yourself fumbling to find the item you need for your baby, when you need it, you might be using the wrong bag. You may be trying to convert a regular backpack by fitting all baby essentials in it. If you want a hassle-free way to travel with your baby, use a real diaper bag. It has more pockets and made of durable, waterproof materials. It is easy to clean and convenient to carry. Some diaper bags come with a changing pad and stroller straps. Others are stylish and trendy. But the most important thing to consider when purchasing a diaper bag is the space and comfort; it should be spacious enough to fit necessary things like baby clothes, milk bottles, toys, medicine, etc. It should be comfortable to prevent muscle pain and keep your hands free. Diaper bags used to come in bright colored designs. But not anymore! They now come in trendy, stylish designs that can complement any outfit and fashion taste, and not make dad feel embarrassed when carrying it. One of the trendy, classical design diaper bags is the Premium Diaper Bag Backpack by Liname. The Premium Diaper Bag Backpack has a total volume of 23 liters, weighs 2 pounds, and dimensions of 11.4 x 5.9 x 15.4 inches. With the features above, Premium Diaper Bag Backpack is no wonder a good diaper bag. Other than that, it has many advantages. Going out can be a hassle when you use a regular bag to carry all you need to take care of your baby while on the go. To make it easier and more convenient, use a real diaper bag that is waterproof, has numerous pockets, and is made of sturdy, comfortable materials. 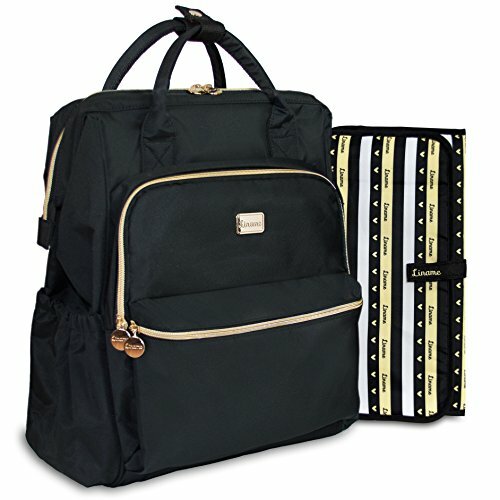 There are a lot of diaper bag brands out there, but not all of them are of good quality. Some mothers are hesitant to use diaper bags because they usually come in bright colored designs. Fortunately, there are some diaper bags that are trendy and stylish. One of these is the Premium Diaper Bag Backpack by Liname. It has a modern, trendy design; it is so stylish that it can be used as a regular bag. But more than style, the Premium Diaper Bag Backpack is very functional with its large compartment and more than 15 pockets. It is made of sturdy materials and with a quality construction. It is lightweight, comfortable, and durable – major factors that make up a good diaper bag. The Premium Diaper Bag is lightweight and very spacious. And above these features and pros, it is affordable.